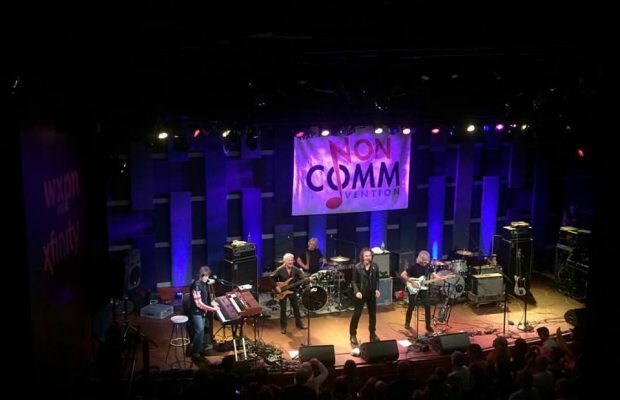 at WXPN’s World Cafe in Philadelphia. 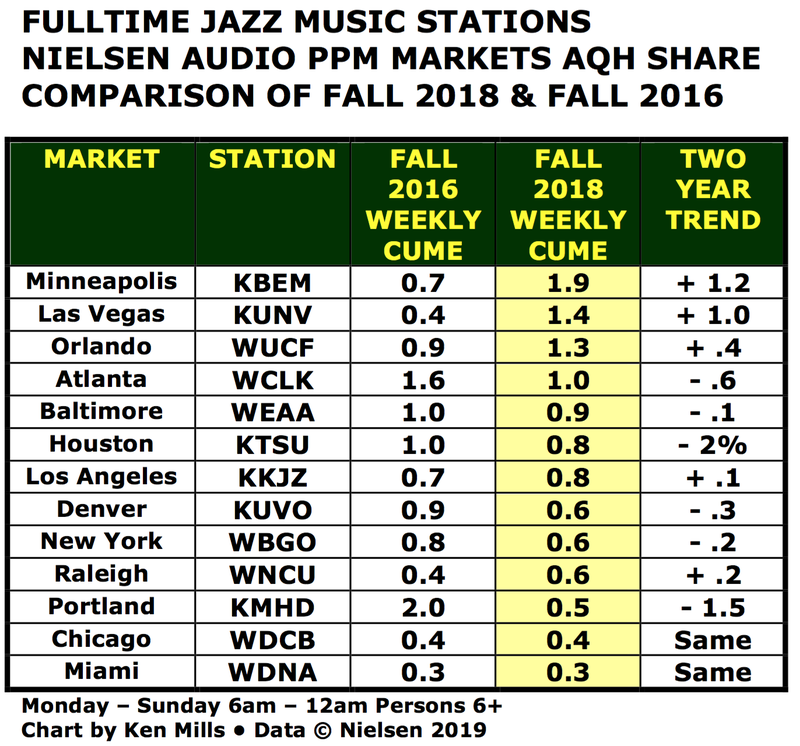 We continue our review of Nielsen Audio PPM ratings for Fall 2018 with a look at full-time Triple A, Jazz and other Contemporary Music stations. We are establishing trend lines by comparing the Fall 2018 numbers with Fall 2016. Over the two years between the surveys, Triple A stations and Jazz stations have traded places. On the left are charts showing the AQH share and weekly cumulative listeners for 16 Triple A stations. Since one station didn’t have Fall 2016 data, so we did not include them in the totals. 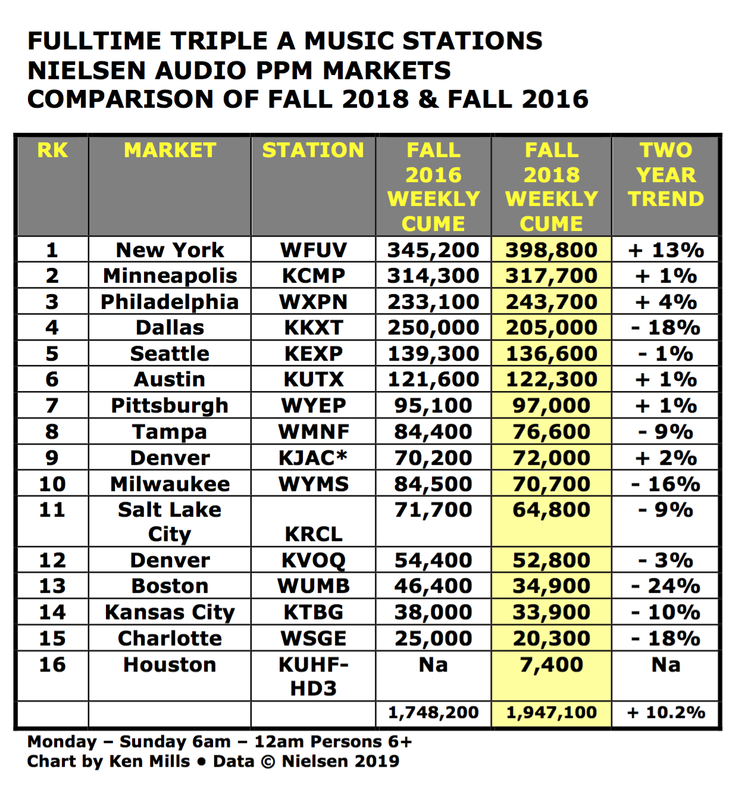 Note how three stations dominate the format’s upward momentum. 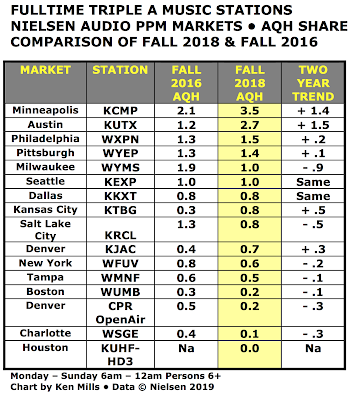 The AQH share growth by KCMP – The Current – and KUTX over the past two years is simply amazing. 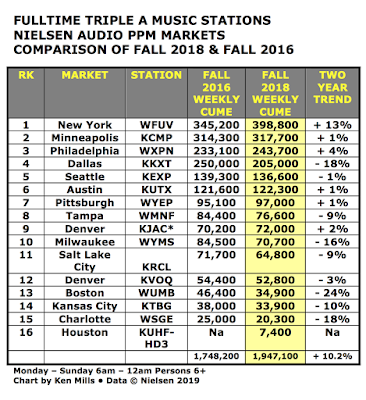 WFUV added over 50,000 new estimated weekly listeners (up 12%) in Fall 2018 compared with Fall 2016. Very few full-time Triple A music stations have an AQH share above 1.0%. Six of the 15 stations have passed that threshold. Programmers who would like to increase their listening base should study how and why The Current and KUTX have become “hot magnets” for listeners. We have written about the drop in listening to some fulltime Jazz music stations recently. 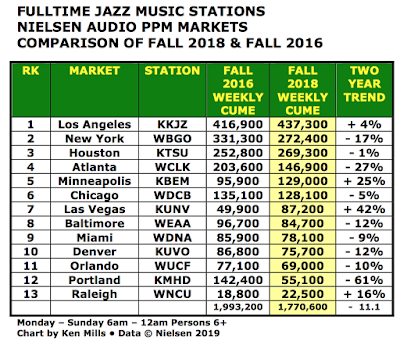 Losses by three stations caused the Jazz format’s drop to fourth place: KMHD in Portland, WBGO in New York and WCLK in Atlanta. We are working on future stories about each of these stations, particularly KMHD. 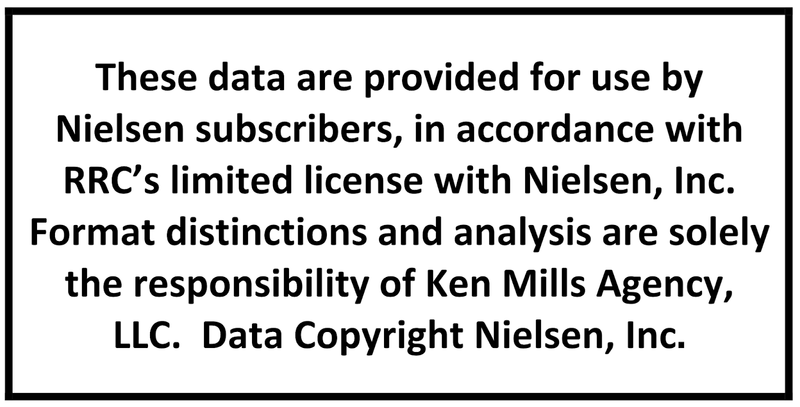 According to local news reports, the licensee of KMHD is considering ending their partnership with Oregon Public Broadcasting (OPB). In mid-January the Mount Hood Community College board voted not to renew the KMHD’s operatiNG agreement with OPB. Mount Hood issued a statement that raised more questions than answers. Mount Hood said they “have interest in bringing KMHD back to the Mount Hood campus.” That’s all they revealed. 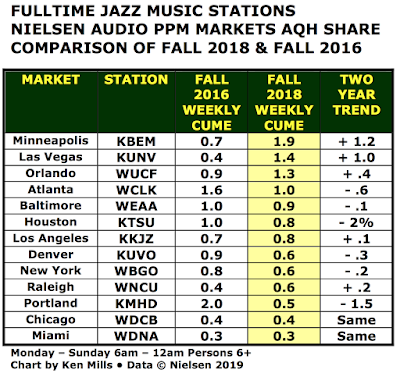 The two fastest growing Jazz stations are KBEM in Minneapolis and KUNV in Las Vegas. 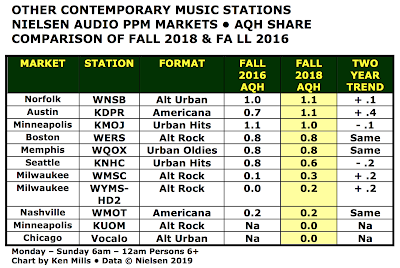 Spark News also examined the Nielsen PPM trends for stations that air other contemporary music formats full-time. 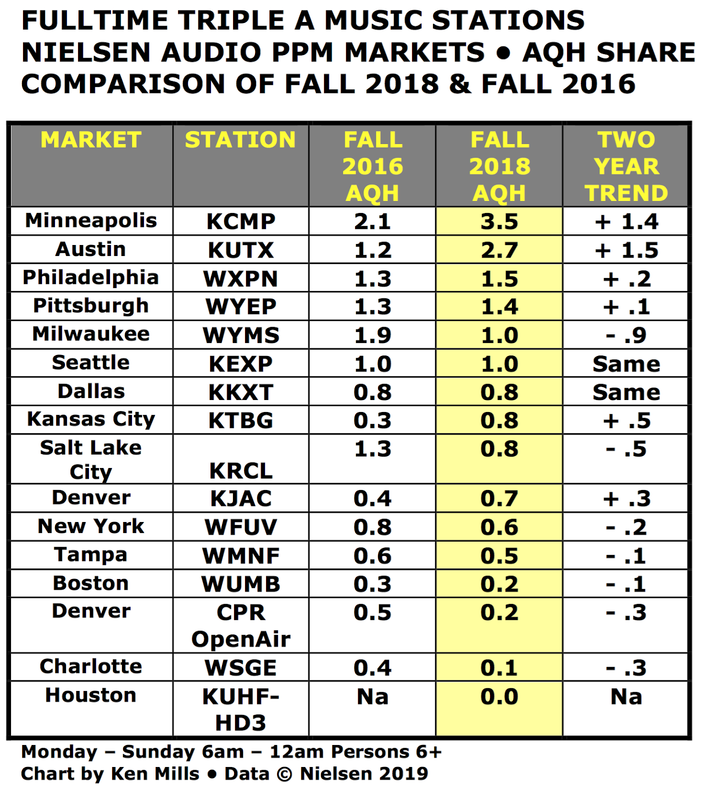 The two top performing stations in the Fall 2018 compared to Fall 2016 were KDRP in Austin and WNSB in Norfolk. We have written often about KDRP a/k/a Sun Radio. It is a conglomeration of five low-power frequencies that Nielsen places under the call letters KDRP. Sun Radio is truly a phenomenon in Austin. The station has some of best known media personalities in the area playing Americana and Austin favorites. WNSB is a participant in a new format development project – Alternative Urban music – funded by CPB. The project is being led by consultant Mike Henry. 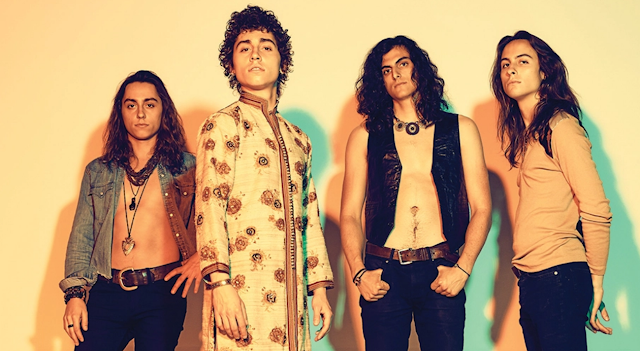 Consultant and blogger Fred Jacobs saluted the group Greta Van Fleet [link] who won the Grammy Award for Best Rock Album. It turns out the group is from Jacobs’ home base in suburban Detroit. I do need to point that WCLK and KUNV both lean towards Smooth Jazz. KUNV also throws in the mix smooth R&B and pop cuts. They are also not afraid to play Herbie Hancock's "Rockit" while popular with his fans it does not quite fit Jazz. While Smooth Jazz was a successful commercial radio format in the 1980's and 1990's, some say the dreaded PPM killed the format. It helped but also some in my peer group viewed it no differently than say Easy Listening/Beautiful Music ala Marlin Taylor's favorite format that he knows and can program. WEAA should be viewed as a Jazz/Public Radio News Talk Station. While they don't carry NPR's drive time flagship shows, I would think they carry their top of hour news and they carry 1A which as you know has become a popular program on NPR News stations nationwide. They also air several local talk shows focused on the African American Community in afternoon from 3pm to 7pm. WEAA also carries Democracy Now! at 5AM weekdays. KTSU is somewhat bull-funky. While its focused on Jazz they daypart certain styles of music like Gospel, Zydeco, Blues, Latin on certain days of the week. WDNA has a consistent program with a focus on Mainstream Jazz, but does focus on Latin Jazz in early afternoons and prime time evenings. Otherwise the other stations listed including KBEM focus on a broad Mainstream/"Real" Jazz emphasis. Why is WWOZ not counted? While its programming might be wack, it is still a respected station in New Orleans. Not sure how it works for the AAA stations, but the jazz stations are indeed a much more mixed bag of formats & styles, even when they fall under the heading of jazz. Unlike the big NPR news/talk stations which are pretty darn cookie cutter 90% of the day, even the biggest, most mainstream jazz stations like WBGO, KKJZ and WDCB do not really sound all that much alike. 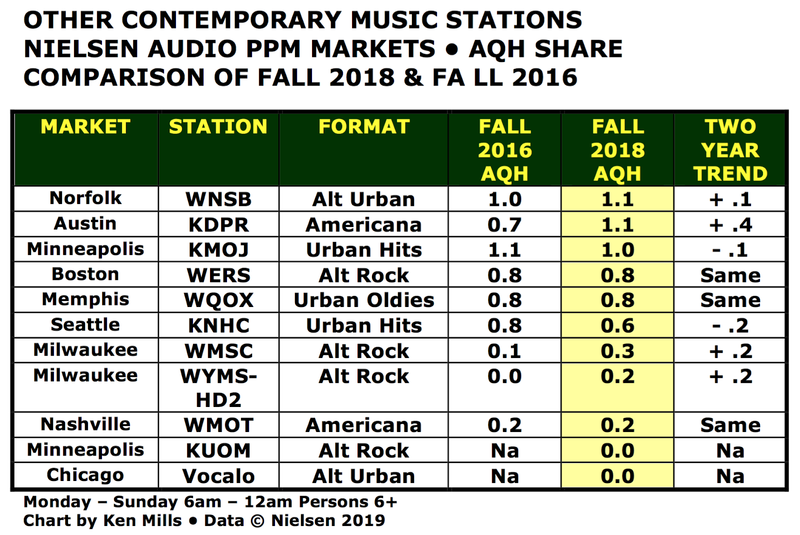 The idea that AAA stations in 2019 have factually more listeners than jazz stations seems not too firm a notion though, regardless. Important to note that even the math in the chart here is off. Using the stats listed here, the jazz stations should have added up to more like 1,855,000, not 1,770,000. 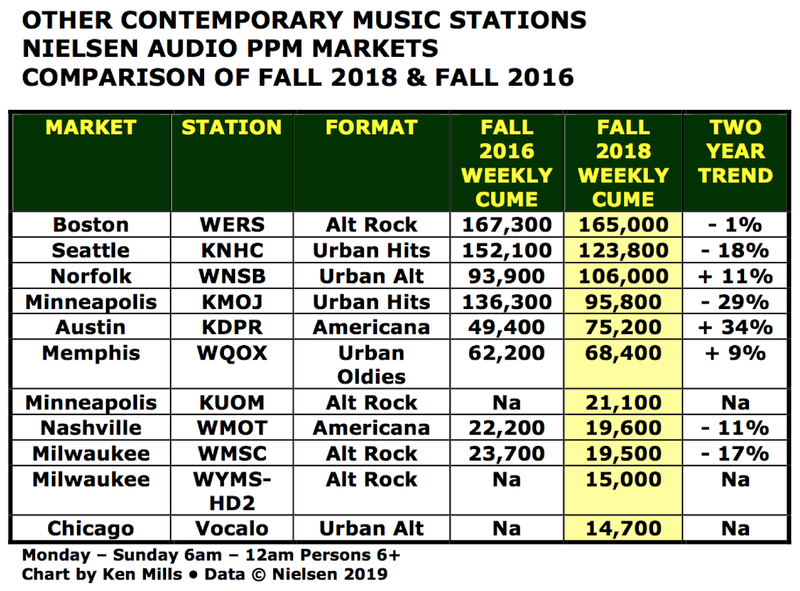 Plus, not even included in that chart are several of the biggest jazz stations in the country - which seem not to subscribe to Nielsens. 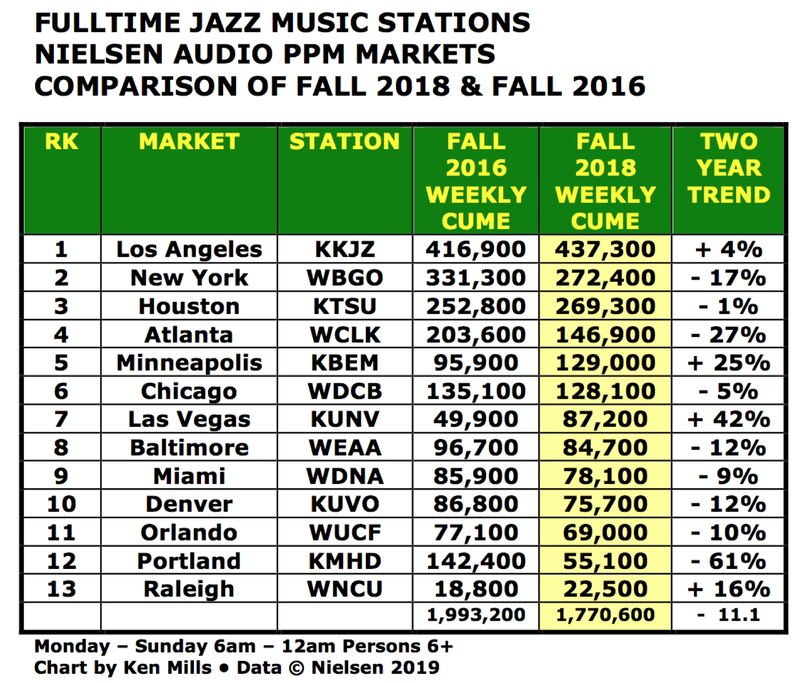 There are at least 3 more major mainstream jazz stations KSDS in San Diego (typically around 80-90,000 in recent books), KCSM in San Mateo (used to clock in well above the 200,000 mark) and KNTU in San Antonio - that's a lot of uncounted jazz listeners. 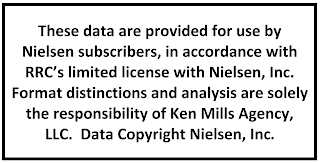 Can't list Nielsens from stations that don't subscribe, of course, but their audiences are substantial, so this is a pretty big asterisk. Perhaps there are uncounted AAA stations in major markets as well? 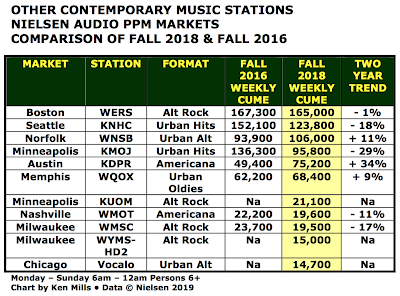 With respect to WWOZ in New Orleans, while it isn't a PPM market, it is market #49 - and their cume was in the 60,000 range recently. A lot of music fans would also differ with the previous comment's assessment that WWOZ's programming is "wack." It's a legendary station that reflects the spirit of its home market quite well. And they've got a huge web listening audience outside their home market too.